Photo: Arthur Orchard – up to twelve such dogs guarded the ‘Neck’. To deter escapees during the convict era a cutting was excavated through the sand dunes on Eaglehawk Neck using convict labour. A line of six to nine large, vicious dogs were then housed in kennels made from old barrels across the gap from Pirates Bay to Eaglehawk Bay; close enough to touch each other but not close enough to fight each other. Oil lamps were fixed on posts at around chest height along the dog line and cockle shells were scattered on the ground to reflect the light. Later another two or three dogs were chained to wooden platforms in the shallow waters of Eaglehawk Bay. 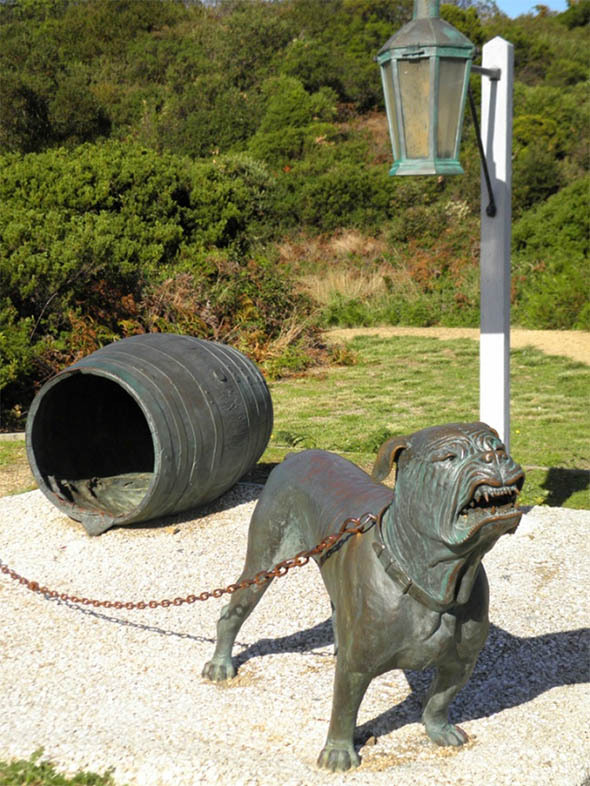 A bronze sculpture of a dog with its barrel-kennel and oil lamp is now a feature on the Neck, near the Community Hall.